How is this for an uphill struggle: in 2010, Lipton Ice Tea, the leading brand iced tea in the United Kingdom, launched a nationwide promotional campaign, giving out free samples, under the headline, “Don’t Knock It Until You’ve Tried It,” because a survey revealed sixty per cent of people claimed hated the taste of the drink, without even trying it. After the campaign, 87 per cent of samplers claimed they enjoyed it, and 73 per cent said they were likely to buy it in future. How is this for a success story: during the summer of 2017, Lipton’s social media feeds in the UK were filled with queries about stocks having run out in stores, particularly Tesco, leading me to drink Lucozade for a number of weeks until supplies returned. For all the hundreds of years of trade and empire-building that fused the British national identity with tea plantations in the Far East, and for all the arguments about whether you add the milk before or after the water - the answer to both is “no” - the UK always drinks its tea hot. It could well be to do with the weather: iced tea had been around in the United States since the 1860s, but gained prominence after Richard Blechynden, a tea plantation owner and salesman, changed his hot tea stand at the 1904 World’s Fair in St. Louis, which also hosted the Olympic Games, to iced tea, as no-one wanted a hot drink in the intense heat. 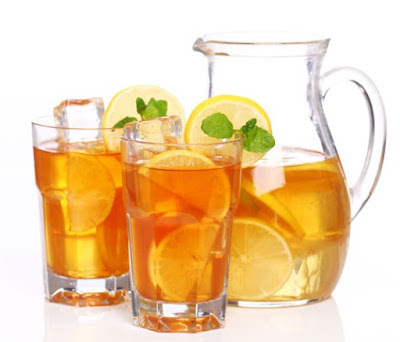 Today, I could make my own iced tea – I have been known to boil five peppermint tea bags in a bowl, put that water into a jug, add more water, but not sugar, and chill – but I usually buy bottled tea, made in the American tradition. Lipton is the world leader at any temperature, having grown from a chain of British grocery shops that bought its own tea plantation to maintain supply. However, in the UK, Lipton is only known as an iced tea brand because Unilever’s other brand of tea bags, PG Tips, is more popular. Also-rans in UK shop fridges are Coca-Cola’s Fuze Tea, and Nestea from Nestlé, and imports like the New York-based Snapple and Arizona. Before I lionise Lipton any further, a taste test is required. I already had Lipton lemon iced tea at home – they sell other flavours, but I find anything other than lemon tends to overpower the tea, which I thought was the point – so I found Snapple’s and Arizona’s equivalent, while a peach hibiscus-flavoured bottle of Fuze Tea had to suffice, as they don’t sell a lemon-flavoured one in the UK. Honestly, all of them have a similar taste, except for the Arizona tea, and I could still taste the tea amongst the peach in the Fuze Tea sample. However, Lipton still wins for me because while it is sweet, the taste of tea is stronger – the others feel a little more like juice with added tea. I left out the Arizona tea from the above because their entire package is curious. 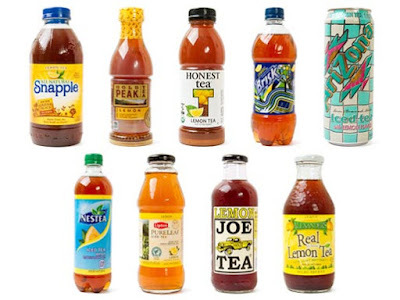 Apart from being a New York-based company using another state’s name, their tea is usually sold in gigantic, luridly-coloured 23 fl oz (680 ml) cans. While this is the only way they advertise, helping to maintain the 99-cent cost of the drink, it also means you are sold what is listed as “3 portions” in a package that cannot be resealed – I had to find a bottle for what I wanted to finish later. Furthermore, Arizona’s lemon tea is made differently from the others, in the common “sun brewed style,” usually done by steeping tea leaves, in non-boiling water, in the sun for hours – the aim is for a more “mellow” taste, but I read it as “weak.” I may prefer my tea cold, but I don’t want the taste to lie down on me either.